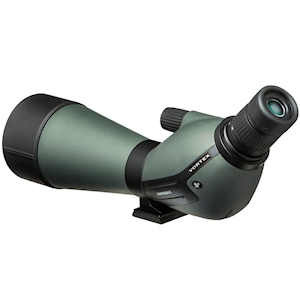 Vortex Diamondback 20-60x80 angled spotting scopes are full-sized scopes. 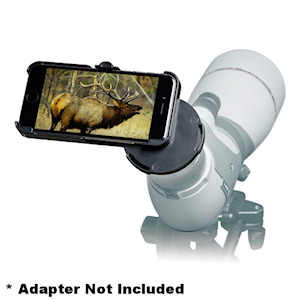 The affordable Vortex Diamondback spotting scope comes with an intrinsic 20-60x zoom eyepiece that features an adjustable soft rubber eyecup. The single wide focus knob has a smooth, easy mechanism. 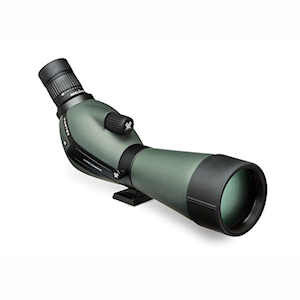 Vortex Diamondback 20-60x80 angled scopes feature fully XR multi-coated optics on all air-to-glass interfaces and dielectric prism coatings to improve light throughput. The exterior lenses are further protected with ArmorTek, the scratch-resistant coating protects them from scratches, oil and dirt. 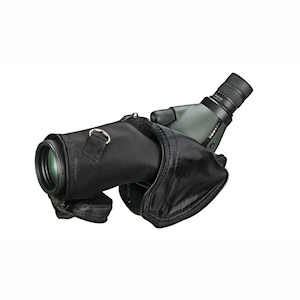 Diamondback spotting scopes are waterproof and nitrogen-purged. The mounting bracket attaches to a ring on the scope body that permits rotation by 135° to either side. Product Weight (oz): 47.1 oz.